They’re perfect for brunch, especially served with tangy Blueberry-Bourbon Barbecue Sauce. toothpicks or small skewers . 1. Set up your grill for indirect grilling and preheat to medium-high. 2. Pinch off 1 1/2-inch pieces of sausage meat and roll each into a ball. Poke a hole in each with your finger and insert a cube of blueberry muffin. Reseal the hole and roll the sausage back into a ball. 3. Brush or scrape the grill grate and oil it well. 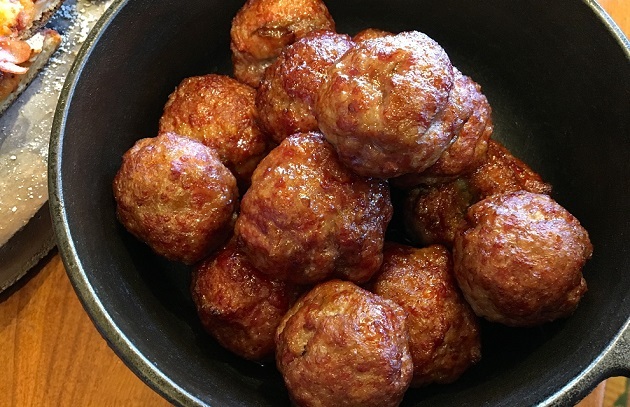 (If using a meatball grilling basket, oil the meatballs before placing them in the basket.) Arrange the sausage balls on the grill grate away from the heat. Add the wood chips or chunks to coals. If working on a gas grill, place the wood chips in your grill’s smoker box or place the wood chunks directly on the heat diffuser bars. 4. Smoke-roast the blueberry balls until sizzling, bronzed with smoke, and cooked through, 30 to 40 minutes. Serve on toothpicks or small skewers with the Blueberry Bourbon Barbecue Sauce, if desired. In a heavy saucepan over medium heat, warm the oil. Add the shallots, garlic, and jalapeno and cook for 3 to 4 minutes. Add the bourbon and cook for 5 minutes. Add the red wine and balsamic vinegars. Stir in the brown sugar, blueberries, ketchup, molasses, coriander, and allspice. Stirring often, cook for 10 minutes, or until the fruit breaks down, to blend the flavors. Add more brown sugar, if desired, for sweetness. Serve warm, or transfer to a covered container and refrigerate for up to a week.